14 of the detained 35 lawyers in Izmir on 22nd September were referred to Izmir Courthouse on 27th of September. While 2 lawyers were released after gave their (defence) statements to the prosecutor, 12 lawyers were referred to the peace criminal judge for arrest. 5 lawyers -M.Ö, S.O, F.A, L.B. and M.D.- were arrested with charge of being member of armed terrorist organisation. Other 8 lawyers were released with probation. The remaining 21 lawyers were referred to Izmir Courthouse on 28th September and 2 more lawyers -A.F.T, A.Ç- were arrested with charge of being member of armed terrorist organisation and 19 lawyers were released with probation today. 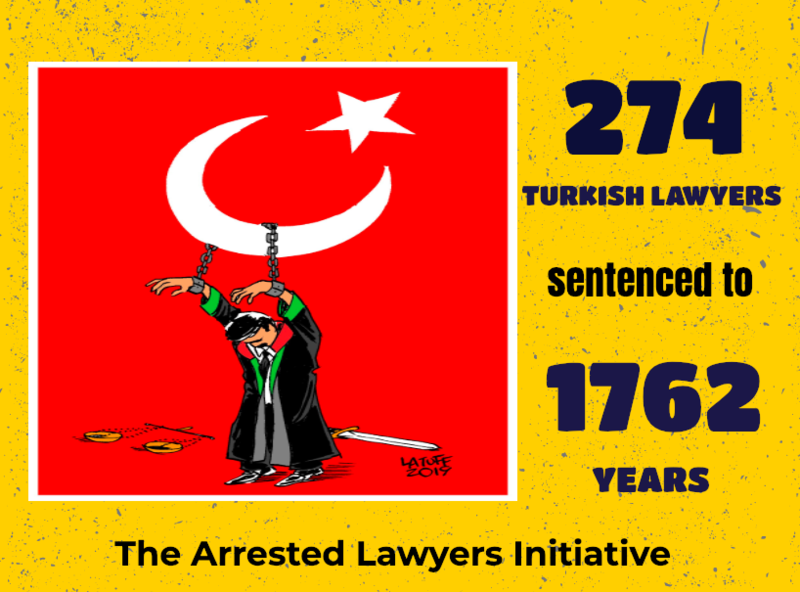 Thus, 7 lawyers were arrested in Izmir in the last week. As of today, a total of 94 lawyers, including the arrested 43 and the wanted 13 lawyers, are under prosecution in Izmir. 3 of the 4 lawyers taken into custody in the province of Isparta on Tuesday were arrested on 28th September. While lawyers L.E, I.A.S. and H.E.S were arrested, C.K. was released with probation. 4 lawyers were taken into custody after the search warrant executed in their offices and residences on Tuesday. As of today, a total of 10 lawyers, -including the arrested 8 lawyer- are under prosecution in Isparta. With this last two waves of crackdown against lawyers, number of lawyers under criminal prosecution raised to 1390; 551 of them have been arrested. As of 27th September 2017, 551 lawyers have been arrested (since 15th July 2016) and 1390 lawyers are under prosecution. Some of the arrested lawyers were subjected torture and ill-treatment.